Despite a lack of meaningful fundamental news and a holiday in the UK, forex markets have provided some positive trades today in particular in the Australian and Canadian dollars which have both strengthened against the US dollar. The moves in these “commodity dollars” has also translated into some mild bullish sentiment for the euro which is now back up above the 1.24 price point, bringing to a halt the recent rout in all the “risk on” currencies. Whether these positive moves continue for the rest of the trading session is debatable given the dire economic news emerging from all the major economies which now appear to be in a synchronised slowdown. However, as forex traders whilst we must be aware of the broader economic and geo political pictures ultimately we must trade what we see on our charts and profit accordingly and not be influenced by what we hear or read. This is not easy and this morning’s long trades on the Aussie, Loonie and Euro are a perfect example of being able to trade counter to prevailing sentiment and personal opinion. The question now is whether this morning’s mildly positive mood will continue and for this we must simply trust our charts and our indicators and of course with Hawkeye we are never in any doubt. The Hawkeye fatman indicator tells us instantly whether a currency is overbought or oversold, which in turn guides us to the lowest risk trades all of which are underpinned by volume price analysis. 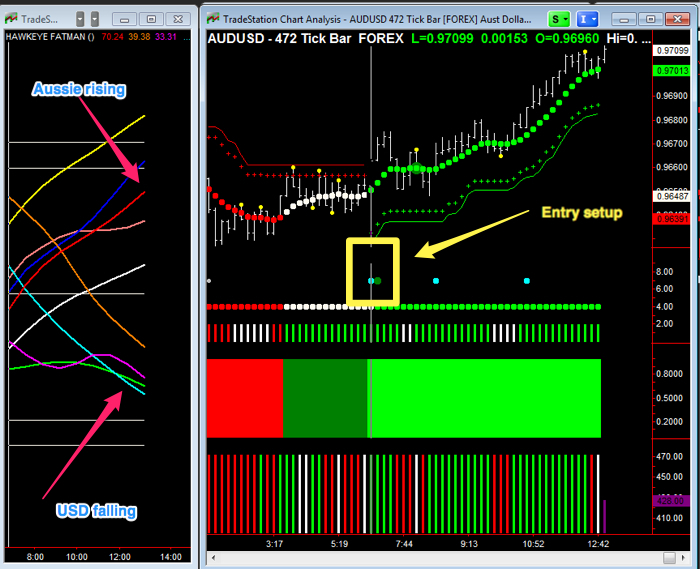 A perfect example of this has been the aussiedollar trade this morning where there was buying volume on both our time frames this morning, supported by a strong green trend and green heatmap with an entry signal early this morning to the long side, from our roadkill indicator. This trade was taken on the 472 tick chart (as shown above) and thus far shows no signs of slowing but instead the pair is looking to re-test the 0.9750 price point. If you are interested in finding out more about Hawkeye and we use it in our own forex trading please just complete the comment form below and we’ll get back to you.